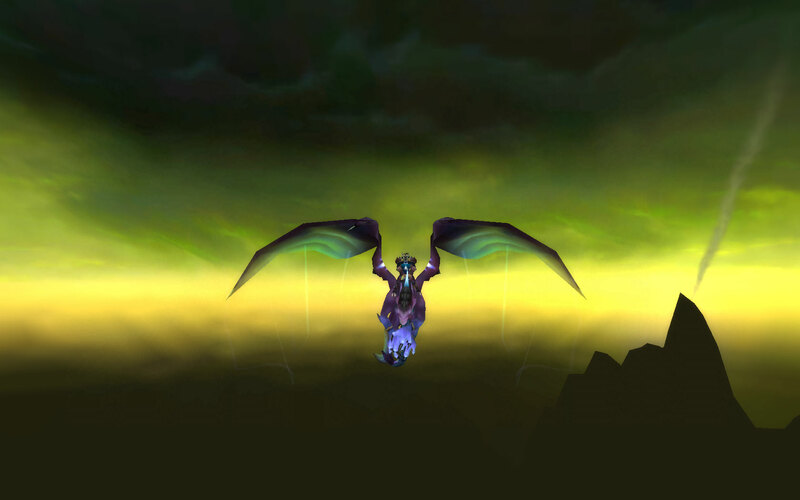 Yes, that is Niqora on a netherdrake. No, she is not exalted with the Netherwing faction yet. This is in fact a glitch that happens sometimes when you’re doing the Netherwing dailies. You know how whenever you fly over Netherwing Fields, you get changed into one of those Dragonmaw orcs and your flying mount turns into a netherdrake? Well sometimes when you fly away, you turn back to normal but your mount doesn’t. It kinda lets you preview what your character looks like on a netherdrake. But before I knew it, we had a group coming together for it. It turns out that the guild leader’s wife also wanted to do the quest so she arrived with the GL’s shammie in tow. The GL of one of our alliance guilds also showed up. It turned out that he didn’t have his flying mount yet…so we all pitched in to buy him one. There was a good bit of cheering as he flew circles around our heads. A few more calls went out and suddenly we had 2 more people who didn’t want the quest but were just willing to help out in return for helping them on another quest. In the end, we had 2 healers and 4 DPS. There was no one to tank. This is where Grakoth stepped up. Remember my warp stalker Grakoth? That’s right, he tanked Zuluhed. With 2 healers on him, he did a great job. I normally don’t pay very close attention to Omen but this time I watched those little bars very closely. In the end there was only one death, the GL’s wife. I think she managed to pull aggro somehow and Grakoth couldn’t get it back in time. I remember trying to smash my Intimidation hotkey as quickly as I could. Either way, her husband rezzed her at the end of the fight and she managed to complete the quest so all was well. Anyways, Niqora is slowly but surely working through the Netherwing dailies. She should be going from friendly to honored today. By the way, does anyone else notice how the Dragonmaw peons say things that reference Silence of the Lambs? Things like “It puts the mutton in the stomach!” and “Why it put da booterang on da skin? !”, which come from the movie quote “It rubs the lotion on its skin”. It’s amusing and creepy at the same time. Comments closed — Trackbacks closed RSS 2.0 feed for these comments This entry (permalink) was posted on Saturday, October 4, 2008, at 3:09 pm by Faeldray. Filed in Friends, Musings and tagged Niqora. Im totally identifying with you right now. I just went through the same thing with the netherwing, zuluhed, the silence of the lambs and all. Also, i played solo for a looooong time, and I recentlyish found a great guild that has really enhanced the game for me!